A nearly complete run in 108 issues (lacking issues nos. 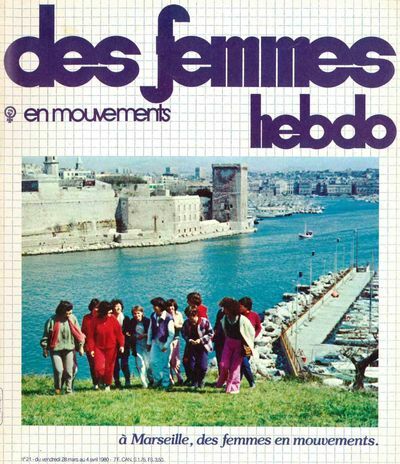 12, 17, 33, 34, 45, 48, and 49 of Des Femmes en Mouvements Hebdo) of all three consecutive series of the French feminist cultural newspaper, originally launched in 1974 by Les Éditions des Femmes and the Psychanalyse et Politique du MLF collective (Mouvement de Libération des Femmes), led by Antoinette Fouque and funded by Sylvina Boissonnas, beginning with the irregularly-published Le Quotidien des Femmes, followed by the monthly Des Femmes en Mouvements, before it became a weekly publication from 1979 through 1982, covering a wide range of diverse issues and topics, including race, genital mutilation, oppression, politics, journalism, terrorism, women working in non-traditional roles, the women's movement domestically and abroad, theater, art, film, and music, among many others. Illustrated profusely throughout from photographs. Various sizes: Le Quotidien des Femmes small folio; Des Femmes en Mouvements 4to. Le Quotidien des Femmes with self-wrpps. ; Des Femmes en Mouvements with original photographic wrpps. Paris 1974-1982. Together with a special issue "Hors Serie - Des Femmes en Mouvements Hebdo: Des Femmes et le Cinema 1978-1982" Le Quotidien des Femmes and Des Femmes en Mouvements are two of the feminist titles that took over from the the newspaper Le Torchon Brûle, which launched in 1971 by activists from the MLF and ran through June 1973. Others included Les Cahiers du Grif, Sorcières, Questions Féministes, and Histoires d'Elles. Antoinette Fouque was a militant feminist activist who founded Editions des Femmes to publish works written by women, about women, or for women, which focused on issues of women's empowerment.